The CR1/3N or 2L76 is a popular lithium cell that is commonly used in cameras and many different electronic devices. The CR1/3N cells have a shelf life of 10 + years. The CR1/3N or 2L76 cell can be used as an effective high power replacement for a stack of two LR44 cells. Specifications︰ Most powerful, longest-lasting CR1/3N battery in economical bulk packaging with an excellent shelf life. Dimensions: 10.8mm x 11.6mm diameter. 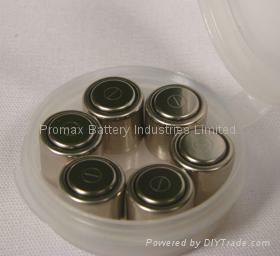 Advantages︰ This CR1/3N 3 Volt Lithium Battery is a long lasting 3V lithium battery. Outstanding performance and reliability combined with a great price makes this 3.0 Volt battery a great buy and 100% guaranteed. For use in: Compatible with some electronic dog collars. Used in Invisible Fence® brand Powercap® collars. Also used in cameras, and other high-drain digital electronics including watches, calculators, keyless entry devices, etc.